Discover serenity and comfort at Lexington Griffin Gate Marriott Resort & Spa. Nestled in the Bluegrass Country hills near Lexington, Kentucky, our hotel is close to downtown and the Bourbon Trail. Relax during your stay with body treatments at our full-service luxury spa. Perfect your skills on our 18-hole championship golf course. Take a dip in our refreshing pool complex. Maintain your fitness routine in our 24-hour fitness center. 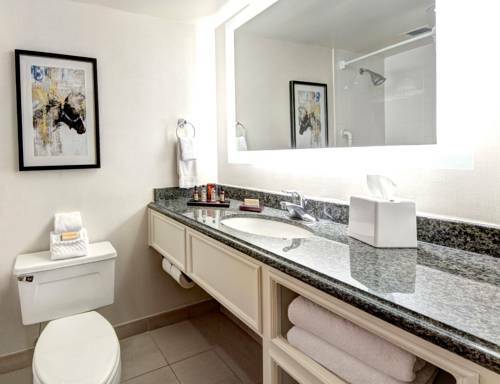 Retire to your luxurious guest room or suite, featuring plush Tempur-Pedic beds and marble bathrooms. Many rooms also feature balconies. Treat yourself to delicious cuisine at our restaurants, including JW's Steakhouse. Visit Kentucky Horse Park, Keeneland Race Track and the University of Kentucky nearby. Take a tour of local bourbon distilleries or explore downtown Lexington, KY. Elsewhere in the hotel, find our 28,901 square feet of elegant event space, ideal for your next meeting or special occasion. We look forward to welcoming you here to our Lexington, KY, golf resort. JW's Steakhouse: Savor Kentucky inspired creations prepared with locally sourced ingredients, from perfectly aged steaks to seafood or salads. Celebrate our Bluegrass heritage through inspiring regional cuisine at our renowned steakhouse restaurant in Lexington, KY.
JW's Lounge: Treat yourself to a relaxing experience at JW s Lounge in Lexington, KY. Enjoy our light bites and cocktails, our custom blend of bourbon, or a bourbon flight. Gather with friends or colleagues for a casual dining experience in our chic bourbon bar. 19th Hole: Discover light fare and beverages at 19th Hole, our newly renovated restaurant at our golf course in Lexington, KY. Overlooking our beautiful grounds in the Bluegrass Country hills, 19th Hole is a refreshing respite for our golf enthusiasts. Starbucks : Stop by our coffee house in Lexington, KY, for our specialty coffees, pastries or tea throughout the day. Browse gifts in our newly updated gift shop. Enjoy cafe seating and check your email or social media with our complimentary Wi-Fi. Top Deck: Grab a quick bite, sandwiches, snacks or a refreshing drink poolside at our golf resort near downtown Lexington, KY. Overlooking our sprawling pool complex, Top Deck is an outdoor, seasonal poolside retreat. Satisfy your yearning without leaving the pool.